Movie biography doesn't have to include the subject's whole life, or even most it, to rivet our attention. For every Ghandi epic there are minor masterpieces like The Train Station (Tolstoy's last days) or The King's Speech (George VI's stuttering). 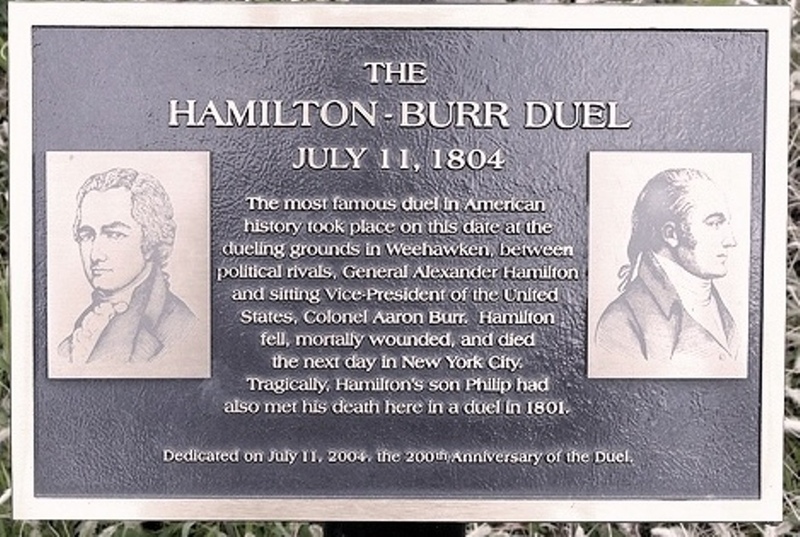 The Duel keeps its focus on the familiar Burr-Hamilton gunfight in 1804, but is as much about Hamilton as any biopic could be (in fact, there is none save for a few TV documentaries). Just in case you missed 10th grade history, sitting U.S. Vice President Aaron Burr (under Thomas Jefferson) challenged ex-Treasury Secretary Alexander Hamilton to a duel because of a long history of real and imagined slights. Dueling was going out of fashion in 1804, but still a resort for those who felt dishonored. Though banned in both New York, where they each lived, and in New Jersey, the penalities were much less across the river, so the duelists conveniently rowed over to Weehauken. They shot at the same time, Hamilton missed (history records he did it on purpose), Burr didn't, and Hamilton died the next day. Not enough suspense for a movie, you say? We also knew the ending of The Day of the Jackal (DeGaulle obviously was not assassinated), but that didn't keep the story (book, movie) from enthralling. In the hands of master director - and Segal is that - this bit of history holds great possibility. How to do it? You can start with the protagonists from their first point of mutual distaste (1791) and move forward. Or you can start with the duel, show the killing, and move to the backstory. Or -- and here is Segal's master stroke -- show the duel to the point of pistols being raised, then fade to 1791 and move forward. This method not only sets up the movie nicely, but keeps attention of those who don't remember (or never learned) high school history. Well, what happened? Hey, this should be an interesting movie! The actors don't let us down. Jay Sarbond as Hamilton and Bill Restick as Burr do a good job of portraying two rather prickly politicos. It is hard to imagine Thomas Jefferson, John Adams, or George Washington (all characters in the movie) getting caught up in this dueling business. By the end we don't much care for either Burr or Hamilton. Let me count the ways: vain, arrogant, adulterer (Hamilton), misanthrope (Burr), just not nice (both). The Duel is not a biography of either man. We do not see Hamilton growing up in the Caribbean (Nevis and St. Croix) or Burr in his formative New York years. 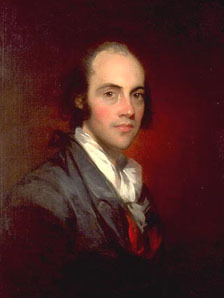 The earliest event portrayed is from 1791, when Burr defeated Hamilton's father-in-law Philip Schuyer for New York senator. 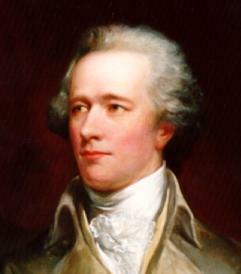 Hamilton was Secretary of the Treasury at the time. Bad words are spilled, but no duel or challenge. Over the next 13 years we witness a conflict between Federalists (Hamilton, strong central government) and so called Democratic-Republicans (Burr, weak central government). Schuyer would have supported Federalist policies. In 1800 the Electoral College deadlocked between Jefferson and Burr for president (73 votes each). Hamilton liked neither man, but loathed Burr, so he maneuvered in the House of Representatives for Jefferson. The tie was broken and Burr became the vice president. Burr: "Political opposition can never absolve gentlemen from the necessity of a rigid adherence to the laws of honor and the rules of decorum." Hamilton: [I have] "no other answer to give than that which has already been given." Both men wanted a duel, it seems. It would have been so easy to avoid. Historians have raised the question of whether Hamilton was suicidal. He had been involved in several other duels. We see one involving an argument with James Monroe (1797), in which neither man actually fired. In November 1801 Hamilton's 20-year-old son was killed in a duel with George Eacker. To what extent did his son's death influence Hamilton in his own duel? If he missed intentionally, was he intending to follow his son to the grave? The thought arises, but is left to the the viewer to ponder. There is less ambivalency about Burr; he is portrayed as vengeful and murderous. 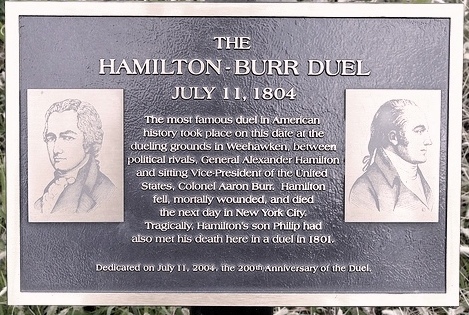 The fatal duel took place July 11, 1804. We see the boats of each party row over from New York, the CGI-created Manhattan skyline in the distance (then, of course, all lower Manhattan). Segal dwells on the ritual that governed how duels are handled: the sequested pistols, the seconds for each man, the requisite doctor. There are initial pleasantries and then we're back to where the movie began. No surprise ending here. Hamilton was mortally wounded and died the next day. 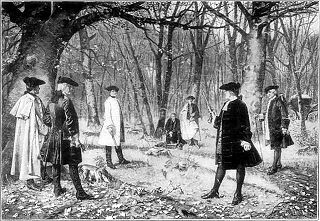 Since dueling was in fact outlawed Burr was indicted for murder in both New York and New Jersey. He escaped to South Carolina, then made his way back to Washington, DC, where he finished his term (and enjoyed immunity from prosecution). Charges were later dismissed but Burr's reputation was finished. A trial for treason in 1807 (nothing to do with the duel) resulted in acquittal. He lived in Europe from 1808-1812 and died in 1836, age 80. There are of course numerous specific events in the lives of great figures that could make for an entertaining movie. How about Truman's decision to drop the atom bomb, a device he didn't even know existed until after Roosevelt died? Or the secret surgery to remove jaw cancer from Grover Cleveland (and the subsequent coverup)? Or Jefferson's affair with slave Sally Hemmings? The list is endless. Movie makers -- where are you? For more on the Duel, see Wikipedia and Mental Floss.